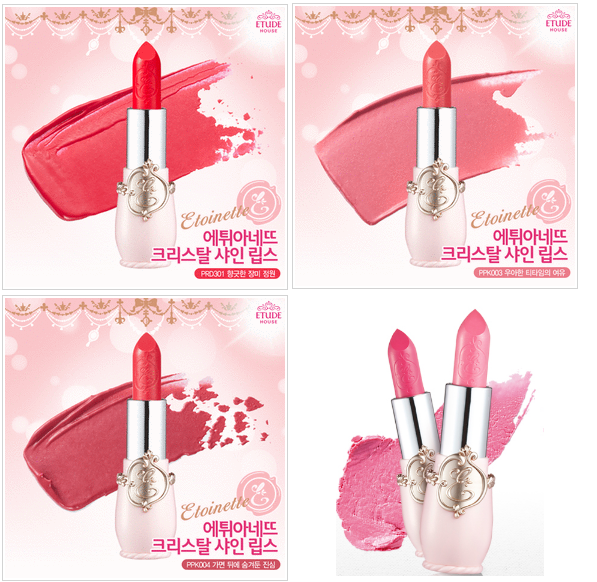 In my 9th Gmarket order post, you must have seen that I bought three Crystal Shine Lips lipsticks, which are part of Etude House's Etoinette line. I have written about this line with a French princess theme before, over here. Today, I will finally reveal which ones, I have bought. I tried to get three different colors that would look good with my complexion and natural lip color. And, I got these three lipsticks! From looking at the promotional pictures and the color chart, I thought that the PRD301 would be a dark pink, the PPK003 would be a light rose pink and the PPK004 would have a darker berry color. They would be three different and interesting colors that I would like to try out. In reality, the PRD301 is a bold red and the PPK003 and PPK004 are not that much different from each other, just by a slight tone (the code name should have been a warning to me). In these pictures, you can clearly see that the PPK003 is a only a bit lighter than the PPK004. They seem practically like the same color; the PPK004 only has an extra hint of berry in the color. The PRD301 is a red lipstick and I had trouble getting the lipstick applied on the inner parts of the lips. You can also really easily see the mistakes, so using a lip pencil would be better. 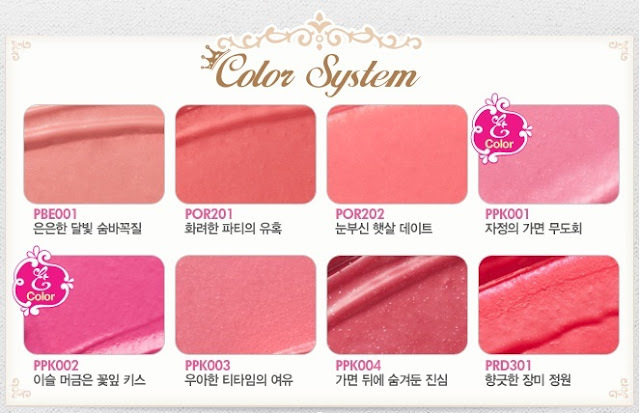 The PPK003 is a light pink lipstick, which is a pretty color that is similar to your lips, but better. I prefer a "warmer" pink, because most of the times I look quite pale and a light colored lipstick does not really help. The PPK004 is a darker pink with a slight berry color in it. From the promotional pictures, I thought this lipstick would be a challenging color, but it is very wearable. It is suitable to wear at the university or at work, whereas the PRD301 is a lot bolder. Although the colors left me a bit disappointed, the texture is really nice and leaves the lips moisturized for the whole day. The Etoinette Crystal Shine Lips lipsticks have a slight glossy finish with very fine shimmers. The PPK004 has the most shimmers and this is also the color that I like the most. It has a berry color that surprisingly looks quite good on me. The PRD301 is a bit too red and the PPK003 is a bit too light pink (as in: too cold).